Hyperbaric oxygen therapy delivers oxygen under pressure to body tissues. The combination of pressure and high partial pressures of oxygen are the primary treatment for decompression sickness and arterial gas embolism. This form of therapy is a very useful adjunct to medical and surgical care in other conditions such as radiation injury and hypoxic problem wounds. The oxygen speeds up new microscopic blood vessel growth in certain types of wound and improves the ability of white blood cells to kill germs. We are located on the lower-ground floor, Parkside West, Christchurch Hospital, near the western lifts. To provide high quality patient care based on a strong commitment to practice, education, research innovation and collaboration within the Hyperbaric Medicine Unit. The Hyperbaric Medicine Unit is staffed by a team of doctors, drawn from various departments (Emergency Medicine, General Practice and Anaesthesia) on a sessional basis, with Dr Greg van der Hulst as the Unit Clinical Director. Technical Officers​, in charge of the equipment and hyperbaric chamber. Registered Nurses both part time and casual. Lorraine Angus is our current Charge Nurse. Hyperbaric medicine began in Christchurch in 1973 with a trial of hyperbaric oxygen (HBOT) to enhance radiotherapy for patients with head and neck cancers. It was also used to treat acute problems such as decompression sickness, gas gangrene and carbon monoxide poisoning. In the late 1970s, the local diving community raised the money for a dual-lock chamber which was donated to the North Canterbury Hospital Board. This operated at The Princess Margaret Hospital from October 1979 until 1994. In late 1995, the chamber and associated plant were moved to Christchurch Hospital, allowing better access to core services such as radiology and intensive care. The unit provided emergency care and treated a few patients with problem wounds. In November 2000, the old chamber was replaced with a new, rectangular, walk-in chamber and permanent staff were appointed. This achieved the goal we set back in the early 1980s to establish the Christchurch unit as a major hyperbaric facility for New Zealand. In January 2004, the compressors and high pressure air receivers were moved into a purpose-built plant room, as part of the Christchurch Women’s Hospital redevelopment. We now have a double compartment 6-person recompression chamber for treatment with hyperbaric oxygen, with permanent medical, nursing and technical staff. In November 2017 the chamber underwent a major upgrade. The panel was upgraded to a fully electronic system and the chamber interior was refurbished. Read here for more information on diving accidents. For medical assistance contact the Diver Emergency Service: 0800 4DES 111. Referrals are accepted from New Zealand south of Taupo. We accept patient referrals from any medical practitioner or nurse in independent practice (such as rural nurse practitioners). For information about how to refer patients from the community, see HealthPathways. Complication rates of HBOT are low and treatment is well tolerated by the majority of patients. HBOT must be used in conjunction with good multidisciplinary wound care. (HBOT) is the intermittent administration of 100% oxygen at pressures greater than normal ambient pressure. There are several ways to provide this, all of which require a pressure vessel in which the patient(s) sit or lie for 2–3 hours daily for several weeks. Locally, we have too small a database yet to have a good idea of how well we are doing. However, of the first 50 lower limb ulcers of mixed aetiology (approx. half DM ulcers) referred to HMU, 18 (36%) were healed and 7 (14%) substantially improved on medium-term (approx. 3 month) follow-up (NNT for improvement = 2). There has been no major morbidity from HBOT in these patients. An on-going prospective cohort Australasian study of HBOT for problem wounds, both diabetic and non-diabetic, with over 400 cases shows a similar early post-HBOT healing rate, increasing to over 75% at one year, irrespective of the aetiology. Despite the Cochrane conclusions, we are firmly of the view, from our local clinical experience that HBOT, combined with multidisciplinary wound care improves healing in selected patients. There are diverse actions of HBOT, including support of oxygen-dependent healing processes and, more importantly, cell-signalling effects that accelerate these processes for many hours beyond the HBOT exposure. The intermittent restoration of steep oxygen diffusion gradients in the peri-wound area stimulates fibroblast function in a dose-dependent manner.10,11 The cyclical pattern of hyperoxygenation/hypoxia leads to the release of local humoral mechanisms promoting wound healing. Recent work suggests a positive effect on nitric oxide metabolism in the diabetic wound. These changes result in an advancing field of neovasculogenesis. At the same time, oedema is reduced improving perfusion, and macrophage function is enhanced, particularly the ‘oxygen burst’ phase, in the hypoxic diabetic wound. HBOT is known to work synergistically with several antibiotics. Daily HBOT also corrects deficient neutrophil adhesion in Type II diabetes. Any diabetic patient in whom a wound is not healing after a reasonable period of multidisciplinary wound care should be considered for HBOT. The international consensus is that an ulcer failing to respond after six weeks (or earlier, if the ulcer is limb-threatening) and for which no correctable large vessel disease is present should be referred for assessment for HBOT. Renal failure and concomitant major arterial disease carry a poorer prognosis for healing with HBOT just as they do with other interventions. Anecdotally, HBOT has been reported to be particularly useful in the neuropathic and Charcot foot. Problem wounds secondary to accidental trauma or medical misadventure in both diabetic and non-diabetic patients may be referred for assessment for HBOT under a prior approval ACC contract that has been in place nationally since March 2002. Many potential referrers are still unaware of this ACC-funded service. Referrals to the Hyperbaric Medicine Unit at Christchurch Hospital may be made directly from primary care. There are clinical HBOT facilities in Christchurch and Auckland, at the RNZN Medical Centre and at Quay Park Medical Centre. 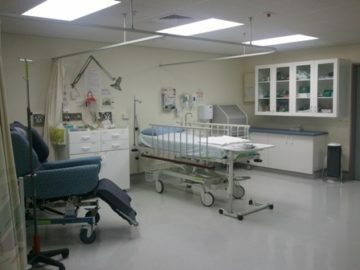 The only hyperbaric facility in New Zealand based in a civilian, tertiary-referral hospital is at Christchurch Hospital. Lee C-T, Ramiah R, Choong SK, Seng KC, Rajoo V. Adjunctive hyperbaric oxygen in diabetic foot ulcers: a randomized, prospective, double-blind study. Proceedings of the Undersea and Hyperbaric Medical Society Annual Scientific Meeting, Sydney, 2004. Londahl M, Katzman P, Nilsson A, Hammerlund C. Hyperbaric oxygen therapy facilitates healing of chronic foot ulcers in patients with diabetes. Diabetes Care. 2010;33:998-1003. The Christchurch Hyperbaric Medicine Unit provides a 24 hour acute service for NZ south of Taupo, on request from emergency departments, ambulance and general practice. Before diving, take a few minutes to review the safety training learned during SCUBA training courses. Service will advise you as to where and how to seek medical assistance. Consider risk of DCI in dive buddies if dive profile similar. Watch carefully. They can get worse! Any record of the diving, i.e., log book, dive recorder or computer. Include all diving within the previous seven days. Remember to secure any equipment used to aid in investigating the cause of the problem. There are few dive areas in the South Island from which road evacuation can be accomplished below 300 m.
Road transport is adequate if quicker or nearly as quick as air transport. Keep patient below 300 m altitude or cabin pressure. Direct transfer from dive site to Christchurch Hospital is preferable if patient stable. Helicopter has limited range so will often transfer patient to fixed-wing via base hospital. For referrers, see Patient Referral and Transfer Procedures on CDHB Intranet, HealthPathways, Blue Book and provided to all Emergency Departments in our region. Hyperbaric oxygen therapy is the administration of oxygen at a higher than normal atmospheric pressure, that is used to treat a limited but diverse range of illnesses. It is the primary treatment for disorders such as decompression illness, arterial gas embolism and carbon-monoxide poisoning. It is also an effective adjunct in a combined program involving dressing changes, surgery and antibiotics for the enhancement of healing in non-healing ‘problem’ wounds. 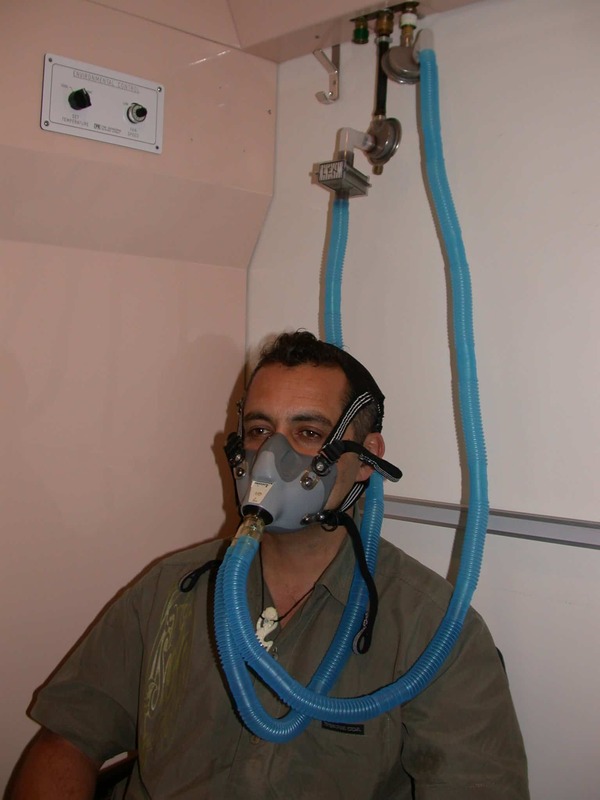 Hyperbaric oxygen therapy is the medical use of 100% oxygen at increased pressure. It works in a variety of ways in the body. This increased pressure provides more oxygen to the body than is possible under normal conditions. Most treatments are between two and three atmospheres of pressure, and the pressure change closely approximates scuba diving. This increase of pressure drives more oxygen into body tissues and wounds that are lacking adequate levels of oxygen (called hypoxia) speeding wound healing and helping the return of normal tissue functions. The length and frequency of treatments is worked out for each person and the condition. Hyperbaric oxygen may be an important part of total care, including wound care, surgery and medication as indicated. For most patients, treatments are daily – Monday through Friday – and treatments may last 2 – 2 1/2 hours. Some emergency conditions will require only one or two treatments. In most cases of wound healing support, the effects are gradual, and 20 to 50 treatments may be required. Who gives me my HBOT Treatments? Christchurch HMU has doctors who have had specialised hyperbaric medical training. The medical team includes anaesthetists and General Practitioners. While in the chamber, treatments are managed by either a Registered Nurse or Diving Medical Technician with specialised training in hyperbaric medicine. 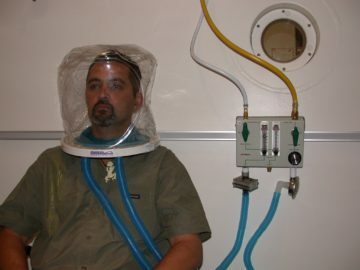 An attendant is always in the chamber throughout treatment. The treatment is managed outside the chamber by a technician trained in pressure chamber operations. Medical care is rapidly available during treatments. What will I feel during the HBOT treatment? Everyone feels fullness in their ears as their eardrums adjust to the change in the chamber pressure. This is very similar to the feeling experienced when in an airplane or elevator. Instruction will be given on how to ‘clear’ ears, or equalize the pressure before treatment. If anyone experiences pain in their ears, the treatment is paused briefly until they are better. 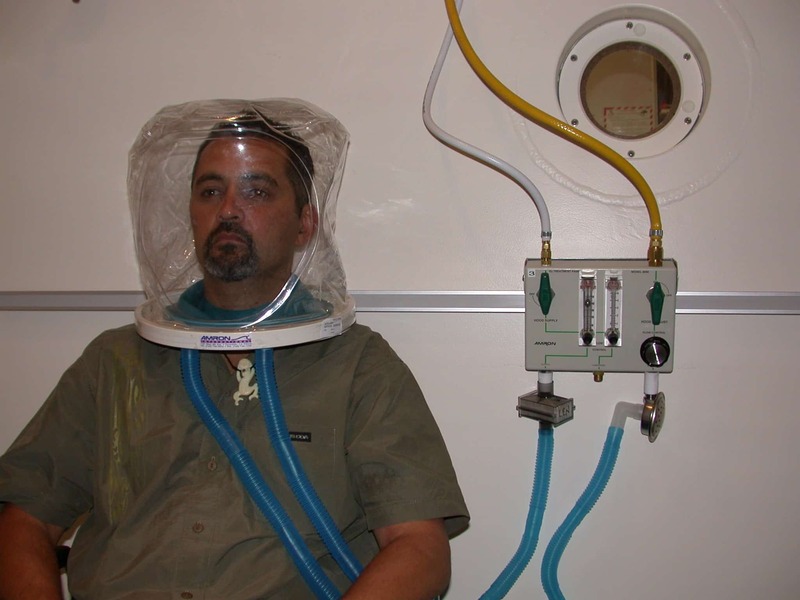 Once the treatment begins air hisses into the chamber and it gets warmer. This will return to normal once the treatment pressure is reached. 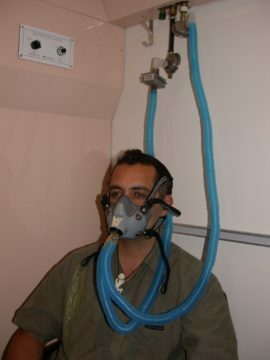 During the treatment patients breathe from a special oxygen circuit through either a close fitting face mask or a clear plastic head-hood. The attendant is there to deal with any problems straight away. What are the risks and benefits of HBOT? There are risks to HBOT, but most of them can be dramatically reduced with the proper management. The risks can be divided into two types, physical and safety risks. The increasing pressure in the hyperbaric chamber can cause ear discomfort and injury to eardrums. If unable to equalise the pressure by swallowing or yawning, a surgeon can make a small temporary hole in the eardrum, as used in children with ‘glue ears’. This is called a myringotomy, and will heal quickly once treatments are finished. About 15% of patients have some degree of problem with clearing ears, this is usually only minor. Oxygen toxicity can occur, affecting less than 1 person in 3,000-10,000, only once every few years in Christchurch. Signs of oxygen toxicity are tingling in the fingers, nausea, dry cough, chest pain and convulsions. Recovery is rapid and complete, although alarming when it happens. During a long course of HBOT a reduction in visual acuity may be noticed. This is reversible in nearly all patients, returning to pre-treatment levels over several weeks or months. Sometimes this may interfere with such things as reading road signs from a distance, so extra care may need to be taken during the course of treatment. Other uncommon problems caused by the pressure change are pain in the sinuses or in teeth with poor fillings or cavities. On very rare occasions, damage to lungs may cause serious injury or death. Fire is a higher risk when the chamber is under pressure because of the increased level of oxygen in the hyperbaric chamber. All patients and staff remove all extra items that might be a hazard. Staff will arrange clothing to wear during the treatment. An undershirt of 100% cotton may be worn, to reduce the risk of electrostatic sparking. For nearly all patients, treatment is painless and uneventful but takes up a lot of time and may get rather boring. No smoking 2 hours prior and 2 hours after treatment. Smoking decreases the amount of oxygen that can be transported by the blood. It is very strongly advised that patients do not smoke during the course of treatment as it reduces the likelihood of the HBOT working properly. Advice on smoking cessation is available from the nurses. People with diabetes on Insulin need to take their insulin and regular diet prior to treatment and, during the treatment, a suitable snack will be provided. Go to the toilet before the start of each treatment. Remove contact lenses and hearing aids before your treatment. Avoid fizzy drinks for 2 hours prior to your treatment. Ring the unit for any cancellations, but treatments should be daily. Get a flu vaccine and avoid people with coughs and colds during treatment. Getting a cold may make ear clearing difficult for a week or two.